Mal aims to misbehave at nerdy conventions. 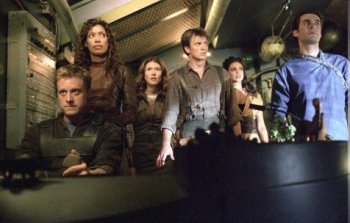 Few properties have inflamed science-fiction fandom more than Firefly. The short-lived TV series only ran for 11 episodes (out of order) before Fox cancelled it, and even a feature film like 2005's Serenity couldn't sustain further investment in Joss Whedon's genre-blending story. Nathan Fillion might just owe his current career - starring role on Castle, voiceover work in videogames - to Whedon casting him as Captain Malcolm Reynolds. The stardom is not lost on Fillion, who is very thankful for everything Whedon has done creatively. For Fillion, the adulation is addicting. "If you want to be a rock star for a weekend, if you want to be adored and flattered and complimented for a weekend, if you want to feel like something you've done is incredibly worthwhile to a huge amount of people, do a sci-fi convention. Well, do Firefly and then do a sci-fi convention," Fillion said. "Those events are just a huge gathering of like-minded people who just want to appreciate you and adore you and tell you how much they love Firefly and there I am in the middle of it saying, 'Me too! I love it too! Right, wasn't it great?'" Fillion believes Whedon's passion is what drove his projects, from Firefly to Dr. Horrible and even the upcoming Avengers film. "Joss Whedon is a guy who does what he does out of love," Fillion said. "He has a love for storytelling." Fillion has a theory as to why Firefly hit such a nerve, and it has nothing to do with Fox's mishandling of the series. "[It was] a sci-fi program that was also a Western program and you have a lot going on with themes, you have a lot going on with story, but the thing is, if you take all that aside, that's not what the show was about," Fillion said. "The show was about people, the show was about people who were heroic, the show was about people who were just struggling, and I think that's something that people can relate to." I can't say I'd want a return to Firefly after such a long absence, but there was something magical about that show. I expect people like Fillion will be talking about it for years to come.